The market’s opportunity is expected to touch US$17.36 bn by 2017. Further, the market is projected to expand at a CAGR of 9.60% between 2017 and 2022 and attain a value of US$27.49 bn by the end of 2022. The escalating industrialization and the augmenting disposable income of consumers are the also projected to drive the growth of this market in the near future, especially in emerging countries, such as India, China, Thailand, and Vietnam. The worldwide market for essential oil is broadly evaluated on the basis of the type of the product, sales channel, extraction method, and the application. Spice oil, herb oil, citrus oil, spice seed oil, and perfumery oil are the main types of essential oil available in the global market. The demand for citrus oil has been relatively higher than other products and the trend is anticipated to remain on an upward streak in the years to come. Majorly, essential oils find application in the personal care and cosmetic, food and beverage, pharmaceuticals, aromatherapy, and the industrial sectors. The food and beverages and the personal care and cosmetic industries are reporting a greater demand for essential oil, owing to the increasing preference for flavored food products and beverages and fragrant cosmetics and beauty products among consumers. The aromatherapy and the pharmaceutical sectors are also expected to register a high demand for essential oil over the forthcoming years. Essential oils are primarily extracted through distillation, solvent, and cold pressing and are sold through specialty stores, drug stores, online stores, and modern trade. The global market for essential oil is also assessed on the basis of region. The Middle East and Africa (MEA), Asia Pacific excluding Japan (APEJ), Latin America, North America, Europe, and Japan have been considered as the prime regional markets for essential oil across the world. Hitherto, Europe has been leading the global market. However, the growth of this regional market is expected to slowdown in the near future due to saturation. The Europe market for essential oil is expected to rise at a CAGR of 8.80% during the period from 2017 to 2022. The European market is closely followed by North America, which is expected to retain its second position in the overall market over the forecast period. The high per capita income is predicted to boost this North America market for essential oil in the near future. The global market for essential oil is highly concentrated with the leading market players creating high entry barriers for new ventures. Young Living Essential Oils, DoTERRA International LLC, Givaudan SA, Enio Bonchev Production Ltd., The Lebermuth Co. Inc., Symrise AG, International Flavors & Fragrances Inc., Citrus and Allied Essences Ltd., Biolandes SA, and China Flavors and Fragrances Co. Ltd. are the key essential oil vendors across the world. With the increasing preference for natural products among consumers, the global market for essential oil is observing a tremendous rise in its valuation. 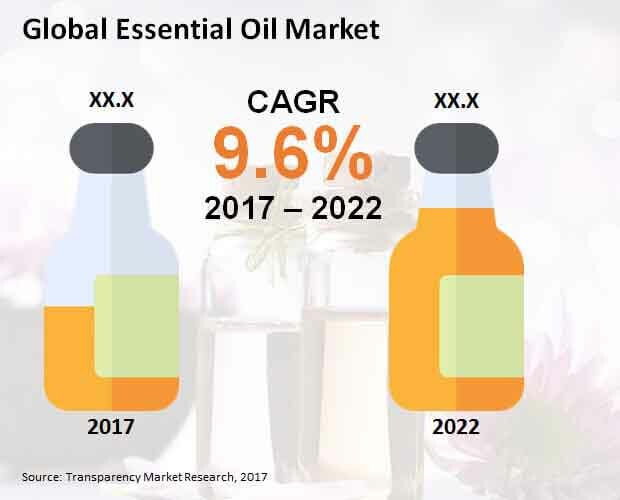 The market is anticipated to remain reporting high growth over the next few years, thanks to the expanding application base of essential oil, from the cosmetics and the food and beverages industry to the aromatherapy and the pharmaceuticals sectors. This research study offers a decisive overview of the worldwide market for essential oil by analyzing this market thoroughly on the basis of its past performance and current status. The future market potential has also been evaluated in details to provide the readers with future projections and forecasts. The overview section also includes a qualitative assessment of the overall market, emphasizing the influencing factors and various market dynamics, such as the growth drivers, limitations, market trends, challenges, and opportunities, together with potential customer evaluation. In addition to this, an analysis of the market’s attractiveness, coupled with the key strategies adopted by the leading players, have been examined thoroughly in this report to explain the intensity of the competition within the market. This research report consists of an exhaustive executive summary and a market snapshot that provide all the important information about various segments and sub-segments studied within the scope of this research. This section also offers significant information and data regarding the global essential oil market with respect to the leading segments based on the key type of essential oil, their application, sales channel, extraction method, and the geographical distribution. Based on the type of the product, the market has been bifurcated into spice oil, spice seed oil, citrus oil, herb oil, and perfumery oil. The performance of these market segments has been assessed at length on the basis of their utility, efficiency, sales, and the geographic presence. By extraction method, the market has been classified into distillation, solvent, and cold pressing. On the basis of application, the market is categorized into the personal care and cosmetic, food and beverage, pharmaceuticals, aromatherapy, and the industrial sectors. Based on the sales channel, specialty store, modern trade, drug stores, and online stores have surfaced as the key segments of this market. Geographically, the market has been segmented into six regions: North America (Canada and the U.S.), Latin America (Argentina, Mexico, and Brazil), the Middle East and Africa (Israel, South Africa, Turkey, and GCC countries), Asia Pacific excluding Japan (India, South Korea, China, Australia, Indonesia, and Singapore), Europe (the U.K., Germany, Italy, Spain, France, and Nordic countries), and Japan. The market revenue for all the segments have been provided here in terms of US$ Mn for the period from 2017 to 2022, together with the cumulative average growth rate (CAGR %) between 2017 and 2022. In conclusion, the market study offers a thorough review of the key players in the global essential oil market on the basis of a number of attributes, such as the overview of the enterprise, with respect to an assessment of its financial status, brand recognition, and the business. The product portfolio, recent developments, and business strategies have also been discussed in this research report. The leading players profiled in this research study are Young Living Essential Oils, DoTERRA International LLC, Givaudan SA, Enio Bonchev Production Ltd., The Lebermuth Co. Inc., Symrise AG, International Flavors & Fragrances Inc., Citrus and Allied Essences Ltd., Biolandes SA, and China Flavors and Fragrances Co. Ltd.